You’ve been on the field at dawn to train for the big game. You’ve supported your team members through the biggest wins and toughest losses. You’ve worked hard to climb to the top of the pack – now celebrate your victory with our signature Holloway Varsity Jacket. Our Varsity jacket embraces the iconic letterman jacket style worn by all of the greatest high school and college athletes. We’ve designed and built our Varsity jacket to be of the highest quality to stand the test of time and look great for years to come. Every part of our Varsity Jacket is completely customizable so you’re always in the team spirit. Choose which color you want on everything from the full-snap front buttons to the high quality rib trim on the collar, cuffs, and fitted hem. Even the varsity jacket leather sleeves and easy-entry front pockets are interchangeable so you can customize the look to fit your needs. That’s right – you can even customize the color of real leather sleeves. With sizing options from XS to 5XL, you’ll have no trouble finding the right fit for every member of the varsity team. We’ve even expanded our sizing options to include Tall sizes. Our Varsity jacket is available in 40 color combinations so you can match the colors to your school and team colors. Once you have it in hand, you can further customize the jacket with team names, logos, emblems, jersey numbers, and more. Your options are endless! 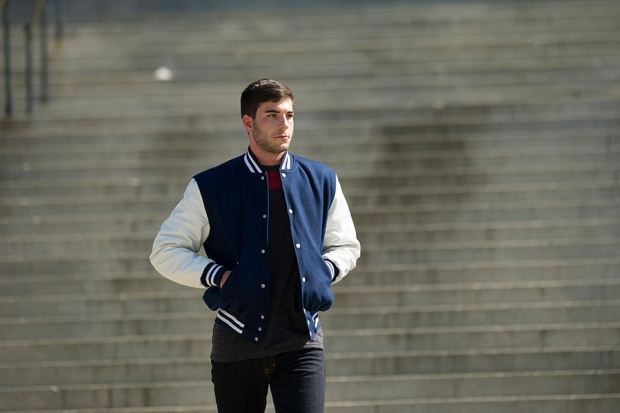 It’s easy to make our Varsity Jacket your own!